I mentioned to him that I was the person who did the “Today in History” slides for our school’s morning announcements. He told me he enjoyed them and always shared them with his first period class, but noted that the “Today in History” slide for the day, Tuesday April 4 was rather somber. I agreed – Dr. King is assassinated. 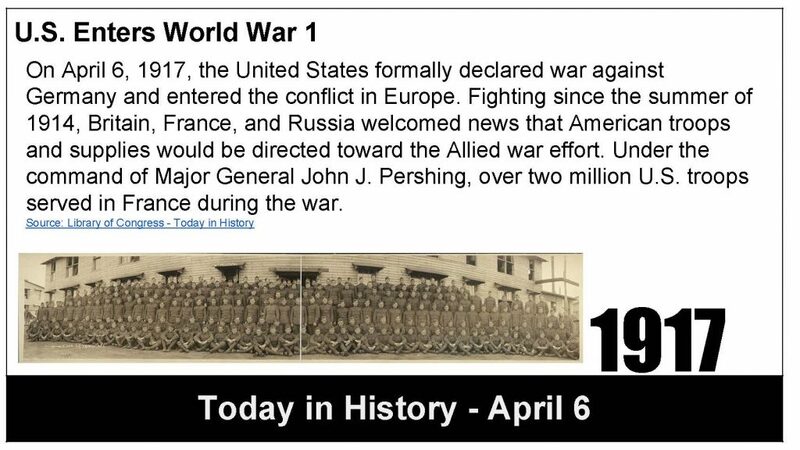 I mentioned that Tuesday was the 49th anniversary of the shooting and that I had planned out several memorable ‘Today in History’ slides, for the remainder of the school year – namely today’s slide – U.S. Enters World War 1. “What a dumb war,” he said immediately. Yes, what a dumb war, indeed. I agreed. I couldn’t agree with him more. It was a dumb war, most wars are.